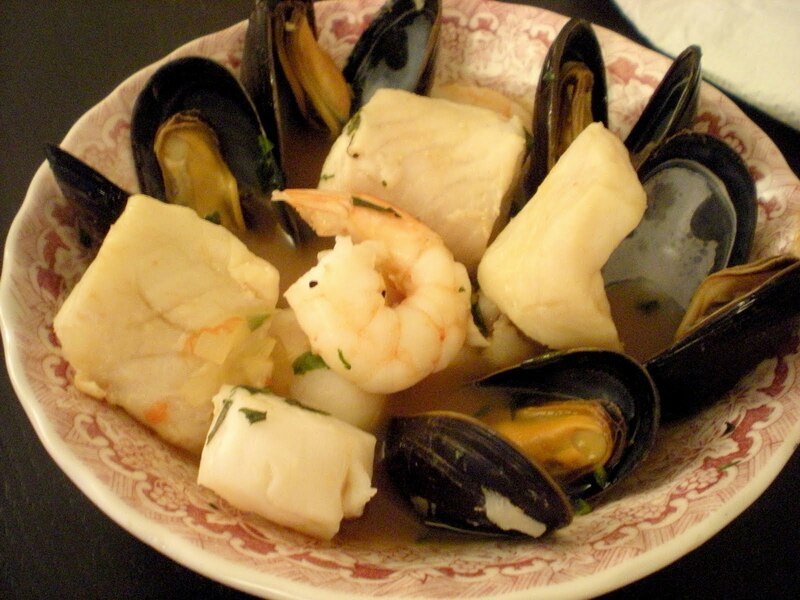 The name bouillabaisse is divided into 2 French verbs : bouillir means to boil and abaisser means to reduce, together it means to reduce by evaporation. 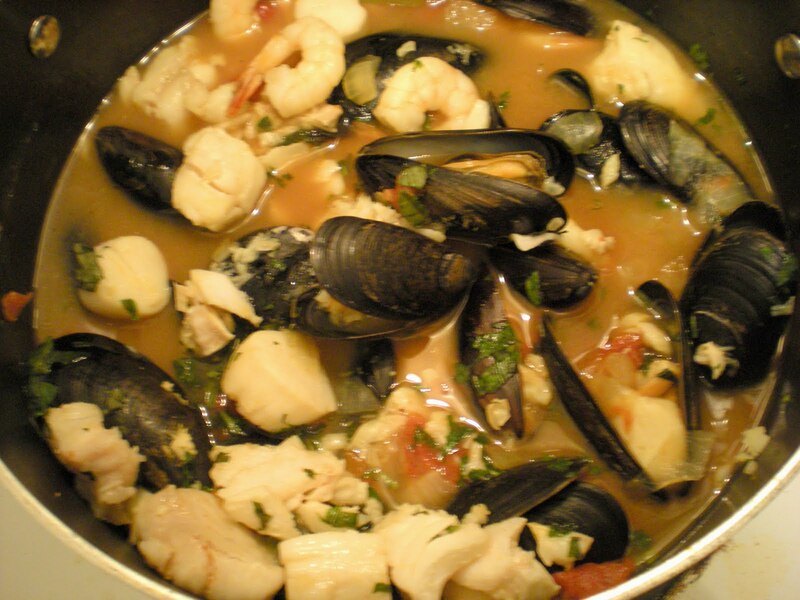 Bouillabaisse is a fish stew which originates from the city of Marseille in France. This is also known as a fisherman's soup using the remains of the day's catch. It consists of a variety of herbs and spices mainly saffron, garlic and bay leaf as well as a variety of white fishes and seafood. You can imagine the amount of seafood flavors in this stew. It is like eating a paella where you can't stop eating until you are full. Try it out, use any seafood and white fishes and let me know the results. Bon appétit! 1. Heat oil over medium heat. Add onions and garlic, cook for 5 mins. Stir in tomatoes, stock, wine, bay leaves, and saffron. 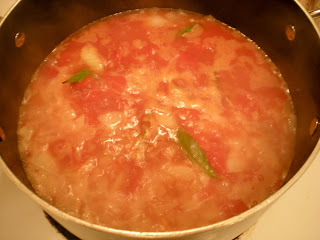 Bring to a boil, reduce heat to simmer for 30 mins. 2. 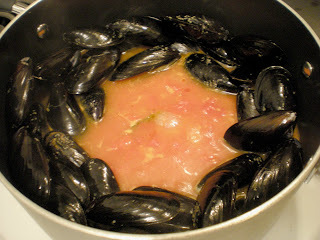 Put in mussels in the pot. Cover bring to a boil for 4 mins. 3. 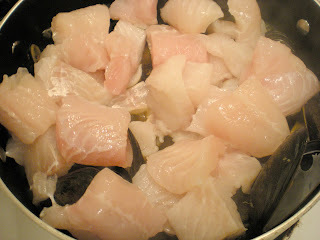 Turn heat to medium-low, add in fish and cook for 3 mins. Simmer for 2 mins. Afterwards, add in scallop and shrimps until the shrimp changes colour, about 3-4 mins. Make sure that the liquid is covering the seafood, add more stock if necessary. 4. Remove from heat. Discard bay leaves, and ladle into serving bowls. Very informative and to quote Dickens: please sir, can I have some more? Aaaah, that looks delicious! I love fish soup in general, and bouillabaisse is such a classic! But I'm wary of making it, because for some reason it's never a huge hit when I serve it to other people - although, maybe my friends just don't like fish soup... At any rate, I would gladly go for a big helping of this lovely dish!